Zinnias! Z. elegans. Zinnias are a tropical annual that originated in Mexico. I have had a big success with them at Hummingbird Hill the past two summers. They are a nice alternative to Chrysanthemums. Here in our Zone 8, Chrysanthemums do not like the hot summers, and the long daylight season confuses them because they are light sensitive, and will not bloom here naturally in the fall like we want them to do. Therefore in Central Texas, people must use Chrysanthemums as annual bedding plants that you buy potted, and they won't return in the spring very well here. 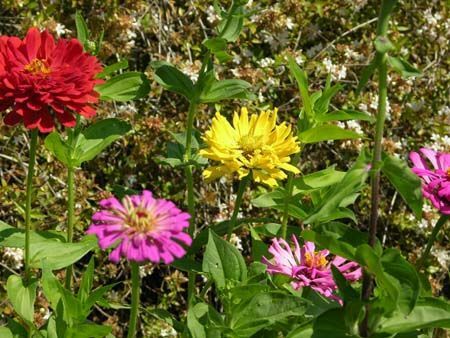 Well, likewise, zinnias are also an annual bedding plant, but if you handle them right, you won't have to transplant them, and they'll be blooming their heads off in happy bright red, pinks, coral, and yellows just in time for the fall. They will do all this without the headache and expense of transplanting bedding plants. Zinnias are the backbone of my butterfly garden, and they seem to last forever when cut. 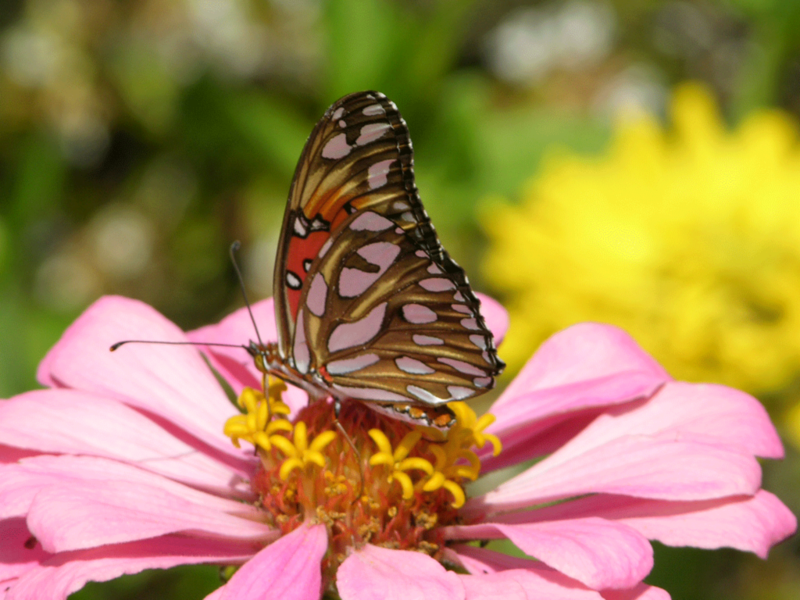 You'll be amazed at all the different types of butterflies that will show up when you plant a zinnia bed. Hummingbirds like them too. They grow very fast, and those that sprout in the spring will begin to dry up by August. Just start a new patch and they'll be blooming magnificently come late summer and fall. They go beautifully with pumpkins and fall decorations, and make great cutting flowers for the fall holidays. I had beautiful zinnias all the way up until November 3, 2008, until we had a killing frost here! type of herbicide that uses glyphosate as the active ingredient does not kill the seeds that come up after you spray. It enters the plant through the foliage. It does not affect the soil. After that, weeds will begin to grow from seed already present in your dirt, and you'll have to weed like everyone else. Just get the small stuff before the roots are hard to pull up. Early diligence is the key to this. After pulling up the weeds and grass that grow from seed, the beds will stay fairly clean the rest of the summer with just a little maintenance. The key to success: important info about soil pH. Before you sow your seed, find out what your soil pH is. You can buy your own soil pH test kit from most garden centers or from a catalog, or you can find out from your local county extension agent where you can send in a soil sample to have it done for you. Once you know your general pH for your soil, you can adjust it chemically or with soil amendments. I like to add a sprinkle of fertilizer high in nitrogen around my beds just to lower the alkalinity. Acid (nitrogen) lowers the pH, Bases (lime) makes it higher. Most plants like it if the soil pH is just about neutral, and right around 7.2 pH. But, many different plans like different pH. Some like it sour, some like it bitter (like food, think lemons and unripe persimmons). You need to know your plant's preferences. For some things, it's just best not to try to grow them where the native soil pH doesn't suit the plant. For instance, blueberries will not grow where the soil is basic. The only soil amendment for basic soil that doesn't use a chemical fertilizer high in nitrogen takes time. An organic mulch is the trick, and turn it under many times, until the dirt is soft and fluffy with rotted organic matter. This may take a several whole growing seasons. I like to do this gradually, not all in one season. I love organic mulch. Any wise gardener uses lots of it. Anyway, I use both chemical fertilizer and mulch on a raw bed. Soon the mulch rots, the pH will stabilize, and you'll use less and less chemical fertilizers. Planting the seed. Now you don't have to wait for the weeds to come up first before you sow your flower seed. Actually, the taller growing flowers will shade out a lot of the weeds and grass seedlings. Likewise, you can plant in the flowerbed as soon as the grass is dead. Don't pull it out. It makes a great mulch. You can mash it over if it is very tall. Use a digging fork such as a potato fork to loosen the sod. Don't bother turning it over. It will just hurt your back. If you have Blackland Prairie soil, you are lucky, but this makes a very heavy sod, and it is almost impossible to dig into thick grass with a regular garden spade. Loosening the sod with the digging fork will be enough, and the dead grass from the Round-Up will protect the emerging seedlings from water spray damaging the fragile young roots. If you don't need to use an herbicide to kill grass, and you want to plant your seed directly in a clean flower bed, scatter some old hay on the bare soil. Emerging seedlings do not like the dirt around their roots disturbed with water spray. Soaker hoses are better, as they are gentle, and less wasteful. Old 2 year old hay has most of the grass seeds already germinated, so don't be afraid to use it. It's great stuff! You will have to water the bed regularly until the emerging seedlings are big enough to go through some dry spells. Zinnias are fairly drought hardy. This summer I watered my full grown zinnias about once a week, and they did just fine through the drought and heat. Varieties of zinnias. They bring every color of the rainbow to your summer garden when little else is blooming in the heat. They also come in a variety of shapes and sizes: tall, short, single daisy style flowers, and big fat, many petaled types. These days you can order seeds of one variety and color, but to me that is boring. I like to mix them up. There are the giants that have large flowers and get quite tall 3', or the button kind that get 1-2'. My favorite variety of giants are the Cactus Zinnia. These are so named because they have wavy, curly petals. The flowers of the giants can get to six inches! All kinds of zinnias are fun. The button variety will give you more flowers/plant. All zinnias are cut and come again flowers. The more you cut them the bushier they get. There is also a new dwarf variety with large flowers that only get 10-12" high and wide that are great for bedding plants. You've probably noticed them around at shopping center entrances and such. These can be ordered from a number of flower seed catalogs. I like to buy my flower seed from "Park Seed", or "Burpee Gardening" catalogs. You can request them to send you a catalog, or order on line. I always use the "Park Seed" catalog as a reference guide for they list the planting zone, water and light requirements, as well as the genus species names. You can 'google' a name and find the online catalog. Cultivation. The trick to getting bigger and more flowers is to not crowd them. 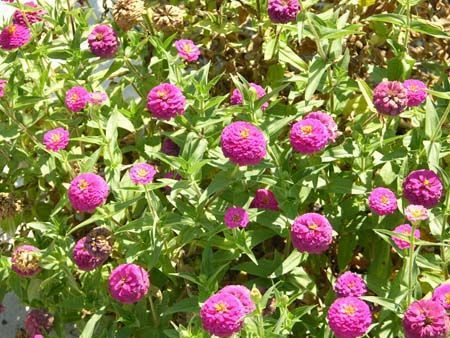 Zinnias need about 8 - 12" of space around each plant, so pull up the excess plants ruthlessly, for they are sure to have a good germination rate if your seed is fresh, and they will grow fast. Zinnias started in the spring will begin to dry up by August. It only takes 6-7 weeks to bloom after the seeds sprout. I like to cut the old zinnias back midsummer and let them begin all over again. After you have started an early summer patch, you will probably not even have to resow them for the fall. Seedlings from old seed heads will begin to pop up everywhere, once the taller plants are cut back and sunlight can get to them. They will come back again in every shape and color just like before. In the photo above, my zinnias resowed themselves very thickly. All I did was keep the bed damp for a week where I had cut them back midsummer and this is how thickly they sprouted. Zinnias have few disease problems. There are new varieties that are disease resistant to mildew and rust, the main problems that zinnias get. Mildew is the foremost problem in cooler, damp weather. Zinnias do best when it is hot and dry on top, and the roots are kept watered and cool with a mulch. I sprayed with a fungicide when the weather turned cool and mildew showed up last year. Mildew looks like patches of white powder on the leaves which then discolor and turn brown. A bad case of mildew can ruin your zinnia bed, and spraying didn't help me much last fall. If you have a bad mildew problem, and you don't like to spray, then buy the resistant varieties. Rust looks like little rusty red dots on the leaves. It is treated with a fungicide spray also. I haven't had much trouble with rust. It just discolors the leaves a little. Don't give up though on fall zinnias because they might get mildew. Zinnias look great with fall decorations. Just order some mildew resistant zinnia seed, and use those in the fall, instead. 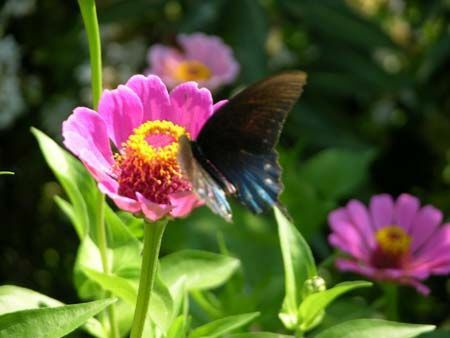 The first thing visitors notice at Hummingbird Hill during the summer are the colorful beds of zinnias and all the butterflies and hummingbirds around them. Most people go away saying, "I'm going to go plant some zinnias!" A Meadow Argus Butterfly with false eye spots on its wings rests on an orange zinnia.